Bonnie Rauter is a just an ordinary Void City girl who happens to be a fanatic and collector of fantastic heavy arms. She frequents a local arms distributor called "Rank & Weller's", owned by two veteran gunsmiths who specialize in heavy weaponry and equipment. However, old man Weller passed away recently, and Rank is having trouble earning enough funds to keep the shop open on his own. Bonnie recognized the old man's plea and offered to help in any way she can. But what can one girl and lots of massive weapons do to earn lots of money really quickly ? One day, a bounty list appered at her doorstep, headed with the title "FIGHT OR DIE 2005". "That's what I'll do !" she exclaimed. "I'll turn in these bounties and get old man Rank enough money to keep the shop open, then the entire city will know JUST how powerful Rank & Weller's weapons really are !" With confidence at heart and a whole lotta guns, Bonnie took off to take part in Void City's deadliest bloodsport. Bonnie has absolutely no formal hand-to-hand training. All her power comes from her massive weaponry. She regularly uses a modified quitripedal combat armor and a modified bigger-than-military-class heavy (and I mean REALLY heavy) rifle. Bonnie's favorite combat armor, Buer is a quintripedal vehicle-like armor that gives Bonnie superior maneuverability as well as protection. Bonnie wears a special suit that allows only her to operate Buer to its full capabilites. The Buer model is normally for scouting and recon duty, however Bonnie has modified Buer to be combat-ready. Buer has no weapons of its own, but its limbs have been modified with hydrolics that allows it to leap great heights and distances. Each leg has hidden wheels that allows Buer to move faster than most automobiles. Buer also has wheels on its bottomside and a jet engine hidden in the back, should its limbs ever be too disabled to move. With five legs, its almost impossible to turn Buer over on its side, and even if so, it is flexible enough to right itself once fallen. Buer still has a wide array of hidden functions that Bonnie has modified herself, but has yet to test. The Barbatos is a gargantuan rifle meant to be used only by heavy combat suits, however Bonnie's standard armor can handle the rifle just as well. Primarily, it has two main weapons: a 45mm heavy cannon and dual 12mm machine guns. 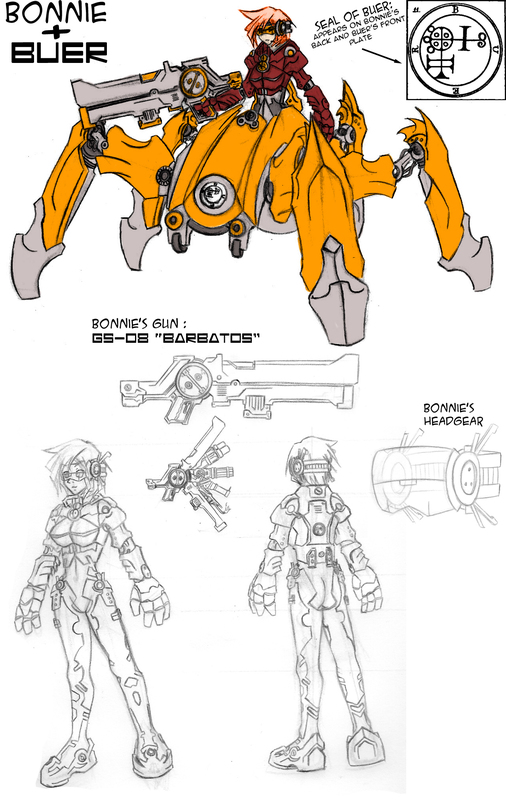 The Barbatos' main feature, however, is the hidden chamber inside the two primary barrels that allows Bonnie to add attachments that expands her arsenal a thousandfold. Attachments might include anything from railguns to rocket launchers to mortars, and even things as mundane as fire extinguishers. In order to operate Buer, Bonnie must wear a special combat suit that armors her upper body. It is made of light metals for upper body flexibility and tight-fitting fabric for increased maneuverability on foot. Her headset gives her a readout on Buer's status and also allows standard viewing functions like night vision, thermoscans or structural analysis.